Beaune is a compact city and the major sights are all in walking distance of each other. 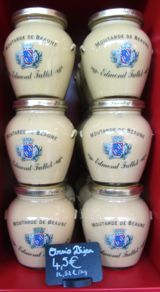 Beaune is a charming small city, with narrow cobbled streets and stone buildings. You can easily walk around the town—within the remains of the ancient city walls—and enjoy the sights and soak in the ambience. You'll definitely want comfortable walking shoes for exploring Beaune; the distances aren't great, but the old stone streets can be quite uneven. You can get a combined ticket that includes the Hôtel-Dieu, the Musée du Vin, and the Musée des Beaux Arts. 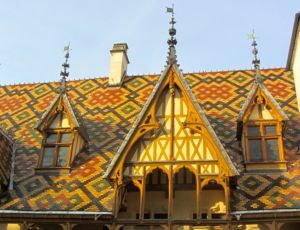 Above, Beautiful tile roof of the Hôtel-Dieu. 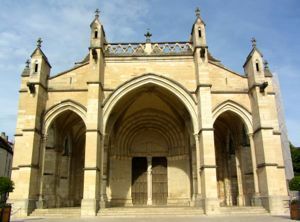 Below, Facade of Basilique Notre-Dame, Beaune.